Keep an eye on this page to keep up-to-date with events where you can meet Josie. Part of the fun of being a children’s author is getting to meet young readers and their families. Josie is available for author visits in bookshops and schools. The visits are great fun for all involved. As well as reading her stories to the children, Josie gets the children involved in art and craft activities based around one of her stories. There might even be a treasure hunt with sticker prizes! Josie Dom is delighted that she has been selected as one of the one hundred companies chosen by Small Business Saturday UK to be featured in this year’s promotion in the run-up to Small Business Saturday on 1 December. The campaign aims to highlight all the hard-working small businesses in the UK which contribute to our economy in many ways, and reminds the public to support small businesses. Josie’s day is Saturday 24 November. There will be a special event on the day. Sign up to Josie’s newsletter to be the first to hear all about it. 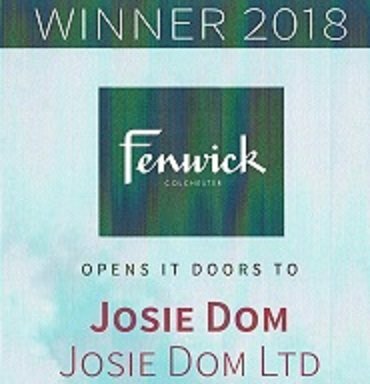 Join Josie Dom in Colchester’s High Street Department Store, Fenwick for story-time sessions and mini storytelling workshops. Books and toys will be available. Story-time is on week days at 10.30am and 11.30am followed by an art session where children can build a house for Lum. Storytelling Workshops are at 11am-12noon on Saturday and Sunday and tickets can be pre-booked here. Or just turn up and pay on the day! Josie would love to answer any questions you have, however, please check below in case it has been asked before. If you can’t find the answer you need below, please send an email to help@josiedom.co.uk. How much is an author visit? Josie charges £300 for a 2-hour visit or a Storytelling Workshop. For a class of 30 children, this is just £10 per head. Library events tend to be free of charge, however, if there is a charge or tickets need to be purchased in advance, it will be noted in the event details above. How can I book Josie to visit my school or event? Email josiedom@josiedom.co.uk with your details and she will respond directly to make arrangements. Or simply complete the enquiry form on the Workshops page.